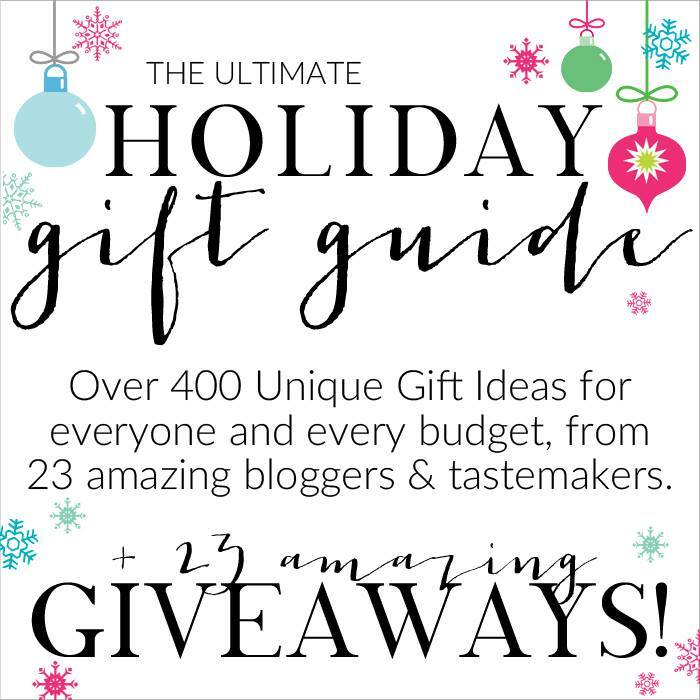 23 of us have been hard at work gathering great gift ideas for the holidays! If you can think of a category, chances are, we’ve got it covered! I don’t know about you, but sometimes when it comes to picking out gifts, I freeze. It is so hard to think on the spot… which is where this fun guide comes in so handy! I love throwing Christmas parties, and I love attending them as well, so the topic I chose was hostess gifts! This is perfect for those parties you will be attending, as well as for those ladies in your life that love to entertain. There is a little something in every price range as well. And, the icing on the cake… Every single one of us is offering a different giveaway today! I hope you will get to visit every blog and enter to win each giveaway! 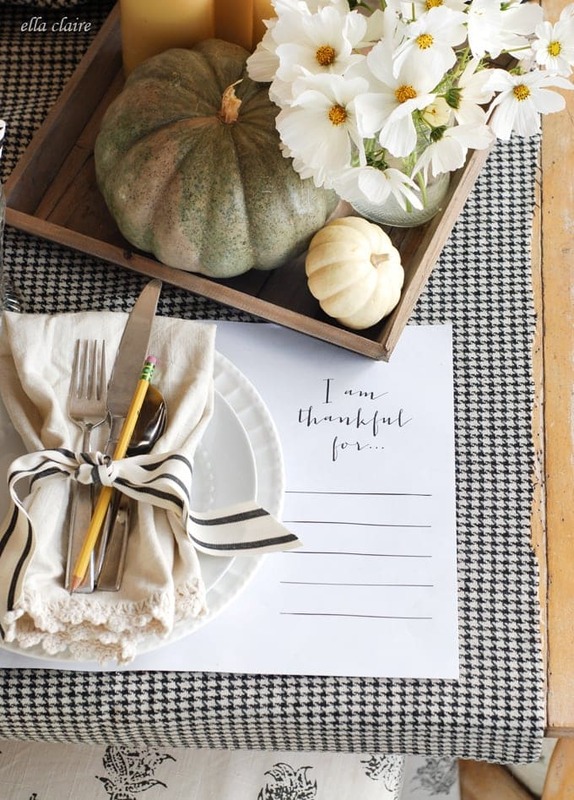 So here are my picks for awesome hostess gifts! 4. Custom thank you tags from Minted. These would make a great gift by themselves or they are perfect to personalize your gifts! 15. Fruit Infusing Water Bottle Fruit infused water is so delicious! It feels so fancy. I love to receive things for the home like hand towels, bath towels, etc. The customizable wrapping paper is amazing! I can’t wait to see yours! I love to give books and music! I like to give either handmade items or things that I have put a lot of thought into that specifically suit the person I am gifting it to. This is a great post and a great giveaway! I love giving friends a holiday gift bag full of my some of my favorite holiday items including beautiful Christmas napkins, holiday candies, cute notepads, monogrammed notepad for each and a Nest “Holiday” scented candle. Love the tea towels, scented candle and throws! I like to buy something I know they wouldn’t buy themselves! I love to give something very personal.When I am talking to someone, no matter when during the year, if they mention something they like, I try to write it down and/or pin it so when the holidays come up, I have the perfect gift ideas ready. p.s.- Favorite Gift: something that smells wonderful! I love getting something that I wouldn’t buy for myself; things that are splurges! Such great stuff, I’m in! Thanks for the giveaway! I love to give and receive gifts that are unique, useful and interesting! I love a handmade gift! I love making and giving homemade gifts but I love receiving frivolous gifts like purses and jewelry! I love getting movies and chocolate and I love giving handmade ornaments. I love to give or receive anything with photos involved. Such wonderful memories! What a fun holiday idea! I would love to win so I could gift someone else such fun things this holiday! I just like getting A gift!! Once you are a mom, you hardly make the list. My favorite gift to receive or give is preferably homemade or something from the heart. I like to receive warm clothing and/or coffee. I like to receive gift cards to restaurants or the movies so that we can enjoy them for date nights for the next year! Please enter me in the giveaway! The Christmas ideas were excellent! I especially love the kitchen towels. My favorite type of gift to give & receive at Christmas is anything coffee related. Like a coffee maker, coffee gift card, or a mug set. I love giving my favorite kitchen items and cookbooks as gifts! I love to give gifts that bring a smile to the eyes! I love to receive Philosophy beauty products and candles! I love receiving fuzzy socks & nice lotions. I love to receive beauty or photography gifts! I enjoy receiving and giving unique or handmade gifts! I love gifts that are super personal to the person receiving them. These are great categories for that! I love to give/receive homemade gifts! This year it’s aprons and mittens that I’m giving. I love to receive scrapbooking related items. I love giving/getting really special customized gifts… maybe something with their babies/families names on it! Those are always the best! I love to give candles as hostess gifts and I’m always looking for new ideas. Thanks for sharing your favorite finds. I love all of the fun gift guides. My favorite type of gift to give is one that shows the care and time I’ve put into finding it for my friend. Thanks for the chance to win this giveaway. Love this list! Ordering the camera for my daughter!! I like to give away and receive homemade treats. I love homemade gifts, gift cards and one of a kind gifts. I am not a fan of cookie cutter gifts that everyone gets that every person on the block probably also get. I like giving luxurious gifts. I love being able to find handmade items that are personal to the receiver. Pillows are great for newly wed couple to find something fun but whimsical that both people will love and enjoy! I love to give gifts that are from my heart and are perfect for the recipient. I love to give more than receive just to make people happy. My favorite to receive (and give!) are homemade gifts – they are always so special! My favorite gift to give to the children is money. I love receiving and giving photos for Christmas. Wonderful giveaway. Thanks for the chance. I love giving unique items that are personalized for the recipient. These are such great ideas! I would love to receive any of them and will certainly be giving a few away this holiday season! Love the nesting measuring cups! Those would be well-used in my kitchen! For a pop of color, I would also love to see a cute set of tea towels (I love these) under the tree this year! My son and I always take a photo with Santa and gift it to my mom (his grandmother). The smile on her face is priceless. I love making handmade gifts to give my family and friends for Christmas! I love reading so I LOVE, LOVE, LOVE receiving books. I prefer homemade gifts, but I do get tired of cookies and breads. I love finding the unique gift that makes someone know I care about them. I love watching them open it up and being so happy! I love to receive frivolous gifts for the home! Love to host in style! I love the cozy throws and chocolates! I love giving homemade gifts! I try to make my son and husband something meaningful every year. I like receiving anything homemade. Love to give and receive handmade gifts! Spontaneous gifts that people aren’t expecting and I also love to do Operation Christmas child shoeboxes. Something homemade is always my favorite. I like to find things for people they haven’t seen/heard of yet. I like to receive cooking, and food related gifts. I love minted! Thanks for the giveaway! Anything edible is always fun! Thanks for sharing! Love all the gift ideas! Fantastic Ideas! I took notes! I love giving art supplies! I like giving and getting money best – let’s me do exactly what I need to do! Great Giveway! Love all the ideas! Something homemade is always a favorite!! I love giving gifts that are hard to find, unique, and have a lot of thought behind them. For each person, it’s most definitely different! I love giving homemade gifts to my sisters. I love recovering gift cards and shoes! I love to give handmade or Etsy shop gifts! I love making gift baskets themed around the recipients favorite things. for those hard to buy people, a gift card is great. I also like to receive gift cards and things made by my children or grandkids and sweets are always welcome since I love anything chocolate. I love doing “my favorite things” gift baskets. That way you’re giving items you already know are great and that you think others will also enjoy. I especially like to include things from small and/or local businesses. Love the glass measuring cups! I love to give and get pretty candles and anything handmade. I really enjoy giving personalized gifts… monogrammed items or framed photos of family members. I like to give handmade items that I make myself. I love to give personal individualized gifts like these! I honestly love to get candles for Christmas! Or really anything that makes my home smell fresh and cozy! I love to give scarfs and fancy body wash to my girlfriends. I usually like to make all homemade gifts for Christmas. I love homemade gifts to give and to receive! So much thought and they are lovely! I love to give my neighbors handmade bread. Most of them never bake for at all, so they really appreciate it! I love getting gift cards for holidays! I love giving graphic t-shirts! I love to give a special Christmas ornaments. I love to give and get anything for the kitchen! I love to give gifts that show I really thought about what to get the person, thatI listened to what they like and love. I love getting gift cards and giving homemade treats. I like to give and receive gifts of food! I love to give candles and gift cards that way people can buy what they want! Food is always a good gift to give and receive. Also, gift cards are nice. Great list. I like to give candles for a hostess gift. I love to receive cookbook or cooking utensils! I love to give personalized gifts! Love giving gift cards!! As long as I know that person would use it and take me with them of course haha!! Spending time together is awesome. I also love gifting handmade goodies like cookies! I like to give handmade gifts. I Like To Receive Or Gift Gift Cards! I like to find really unique little things that people ordinarily wouldn’t buy for themselves. I love anything handmade, DIY, or giftcards! Oooh! I would love to have any of these items! I love to host! I love to receive decorating and kitchen items!